Built for durability and maximum efficiency, our pre-fabricated and pre-engineered building exteriors are constructed of 16 gauge piers & headers. Our piers & headers are offered with a baked on enamel finish in one of our many standard colors or a masonry textured finish in one of our many standard colors as well. Standard gutters, roof-line trim & downspouts are offerd with a baked on enamel finish in one of our many standard colors as well. Hallway entry doors for climate control buildings are shipped pre-painted in white and can be field painted to any color desired. 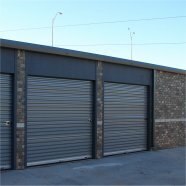 Cannon Storage Systems, Inc. masonry textured finish is a masonry product. This finish complies with most local governments regulations regarding the exterior facade for commercial buildings. 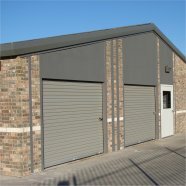 The masonry finish provides the look desired for a Class A storage facility, getting away from the undesired and often not accepted corrugated metal panel look. Buildings with gable style high pitch roof systems will have stacked header panels for that unique architectural masonry unit look. 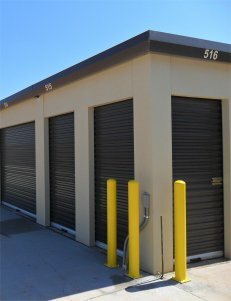 Cannon Storage Systems, Inc. piers can also be reversed and filled with brick for that additional look of class for your storage facility.